We heard a rumour a while back that Illumina, the company who makes the most popular genome sequencers, were considering letting genome scientists use its human-only X10 machine for non-human genomes. It was something that we hoped would happen at some point in the future but figured it certainly wouldn’t happen in time for the Manx cat genome project…until Illumina surprised everyone and announced it a couple of weeks ago. To say we are excited about how this could help the Manx cat project is an understatement! 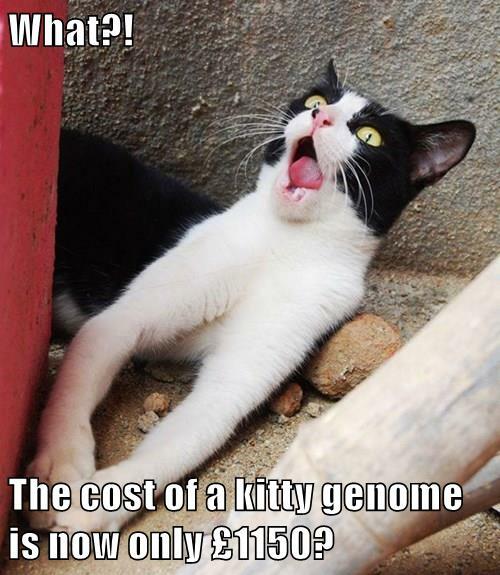 We went shopping for quotes immediately and the impact this is going to have to this project is pretty amazing: the cost of the genome/DNA sequencing is now going to be £1150 per cat. There’s still the price of the vet fees for a spinal X-ray and blood tests and then the price of extracting the DNA from a blood sample but in total we’re now only having to raise £1400 per cat! Pretty amazing, right?! If you haven’t bought a wristband yet or donated to the project please do so as the goal just got ten times smaller! The goal of sequencing 3-5 cats to figure out exactly how Manx kitties are unique just got so much more achievable.